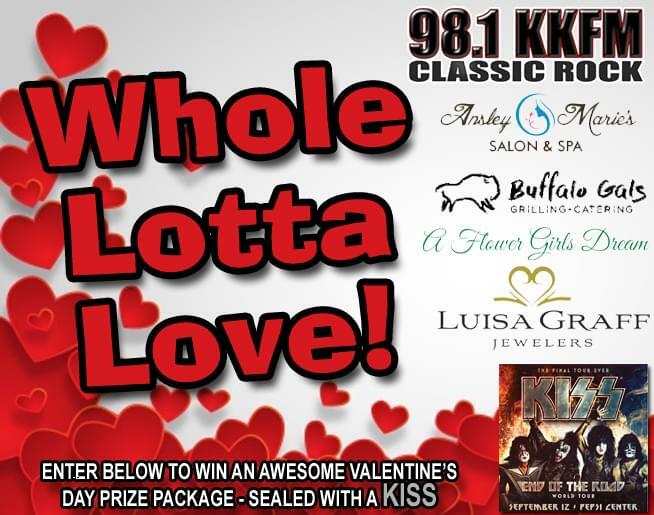 This Valentine’s Day, get a WHOLE LOTTA LOVE from 98.1 KKFM! The big day is coming and you need OUR help… again. Of COURSE we got your back. We’ve teamed up with Luisa Graff Jewelers, Ansley Marie’s Salon and Spa, A Flower Girls Dream, and Buffalo Gals Grilling for the ULTIMATE Valentine package – and of course, it’s sealed with a…KISS. Besides all these awesome gifts, we’ll throw in two tickets to see KISS this summer! One entry per person. Contest rules here.